There’s a great mobile app called Duolingo. It makes learning a new language a game. You can spend a few minutes a day, or, if you’re like some of us, you could actually replace a lot of time-wasting (checking social media, crushing candy, hurling birds at farm animals) with an equally addictive but far more productive activity. Language matters, after all. 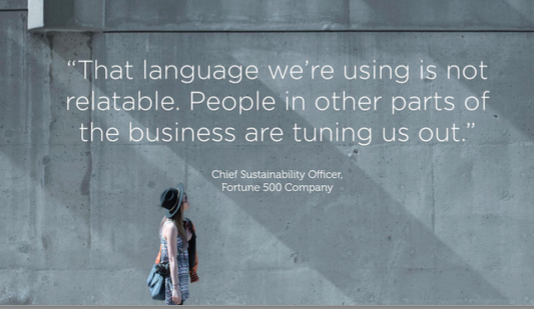 Betsy Henning, CEO & Founder of AHA, recently spoke on the language we apply to sustainability. Henning calls out a number of problems related to the language we use when discussing the mission and results of our sustainability efforts. Essentially, we speak about environmental issues as effects, not requirements. The net result is that sustainability continues to be something apart from our businesses, not an integrated element of conception, design, production, and consumption. That’s a mistake, and something Paper Water Bottle strives to correct. Sustainability isn’t a gimmick after all; it’s a necessary element of good design. So how do we speak about it effectively, in ways that our partners and consumers can understand? Paper Water Bottle believes that language should be affirmative and proactive, looking ahead to innovation and improvement. Those are things, after all, that everyone can agree we need more of. You can condemn all day long, but what we need is redemption. That’s an idea you may have seen elsewhere; no reference is provided here. But when you are next tempted to point a finger, ask yourself if there isn’t A Refreshing Alternative.